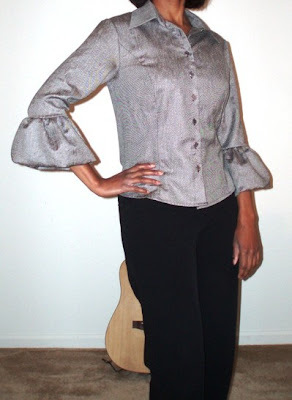 Pattern Description: This semi-fitted shirt has princess seams, a mock front band, a collar, a collar band, and a shaped hem; shirt B has a three-quarter length “bubble” sleeve ruffle with stay. It also includes pattern pieces for A–D cup sizes. Pattern Sizing: 6-20. I made a size 10 in a C-cup. Did it look like the photo/drawing on the pattern envelope once you were done sewing? Yes. However, my bubble sleeves are much more voluminous than the sleeves in the pattern photo. Were the instructions easy to follow? The instructions were easy to follow at some points, but some of them I felt were questionable and I initially had trouble with the bubble ruffle. First of all, make sure you clearly mark the lines for the mock front band in such a way that they don’t disappear when you press the fabric. When constructing the mock front band (both left and right sides), the directions tell you to fold over and press at the first line, then stitch “invisibly” (whatever that means) down the length of the front and baste the upper and lower edges. 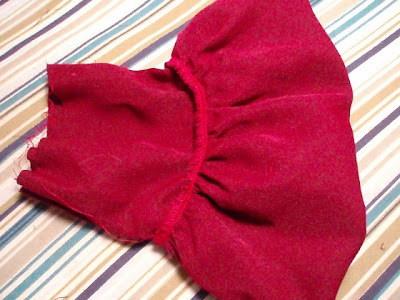 Then you are to fold and press again, and stitch down the length of the front, and again baste the upper and lower edges. Then you are to go back and topstitch the length of the front band on top of the last marked line (not to be confused with the center line of the blouse that you have to mark as well). This just seemed like a bunch of stitching, so I simply folded and pressed along the lines, and then topstitched through all of the thickness. You’re supposed to stop at the last 4” from the bottom. 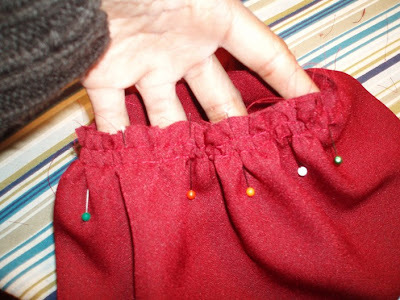 At first I didn’t understand the rationale behind this, but when you hem at the end, the directions tell you to open the inner flap, fold up the hem allowance, stitch, close the flap and finish the rest of the hem. Then you go back and stitch down that last 4” that was left open. I guess it all depends on your personal preference on how you want your hem to look. I stitched down the 4” and then hemmed. It wasn’t bulky and the seam lies down pretty flat. The collar and collar stand were a challenge for me. I bought a point turner to help make sharper points in the collar, and I think it worked okay. I really can’t tell much of a difference between the muslin collar I turned without the tool and the collar on this shirt. Getting the collar stand to meet perfectly at the neck edge was another challenge. On the muslin, I came up short and had stitching from the seam underneath showing through. 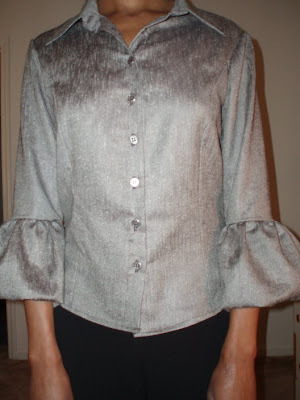 On this shirt, I did the opposite and still did not get the collar stand on one side to perfectly match the neck edge. I don’t think the average person will notice though. For the stay and bubble, you gather the edge of the bubble and baste then stitch to the stay. My boo boo is when I was ready for the other edge of the bubble, I neglected to turn the stay through to attach the other bubble edge to the other stay edge. So in effect, I gathered both bubble edges and sewed them to the same stay edge. Oops! Luckily this mistake was made on the muslin and not my final shirt. What did you particularly like or dislike about the pattern? I liked the princess seams, which provide nice shaping, and the sleeve variations, especially the “bubble” sleeves. Pattern Alterations or any design changes you made: I increased the width right under the sleeve cap to give myself more room under the arm–so I can raise my arms comfortably. I also opened up the elbow area to give my self more room to bend my elbow. Would you sew it again? Would you recommend it to others? I might finish the muslin I started. The fabric was left over burgundy polyester peachskin that I made into a dress. Now that I’ve made this shirt twice and know what I’m doing, I would certainly recommend this shirt to others. Conclusion This is a wonderful classic shirt with stylish sleeve variations, and will make a nice addition to your wardrobe. I am working on this shirt currently. Your shirt is beautifully done. When I read the instructions I to wondered what it meant by sew invisiblely. You have given me an idea on how to solve that problem. My solution was to slipstitch. Also, I used a techinque that Tany uses, thread tracing. It extra work, but it when you meed to see marking on both side of the fabric. Beautifully done. Great color choice. Via PR I came to your blog and just have to tell you, how much I love your Swap so far! The pants are awesome, the jacket looks great on you and especially your colourcombinations are noteworthy! Love Love Love It! !Looks great on you! Great shirt! I love the fabric. Very cute!!! I love it. I wondered how this shirt would look in person. Now I know. It is definitely on my list of things to make now. This is one of my favorite shirts also. Yours turned out beautifully – great color. What a beautiful shirt, and absolutely fabulous fabric. 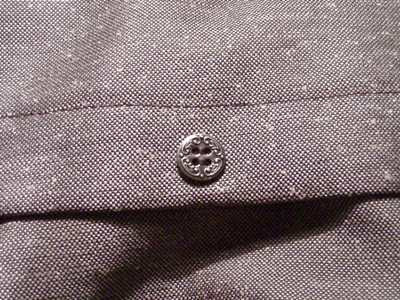 Your close up of the button shot really shows off how lovely this fabric is. I’m glad I found your blog. I’ll be adding it to my must read list. This is my absolute favorite shirt! Yours looks fabulous! I have yet to make this top! Thanks for the review!